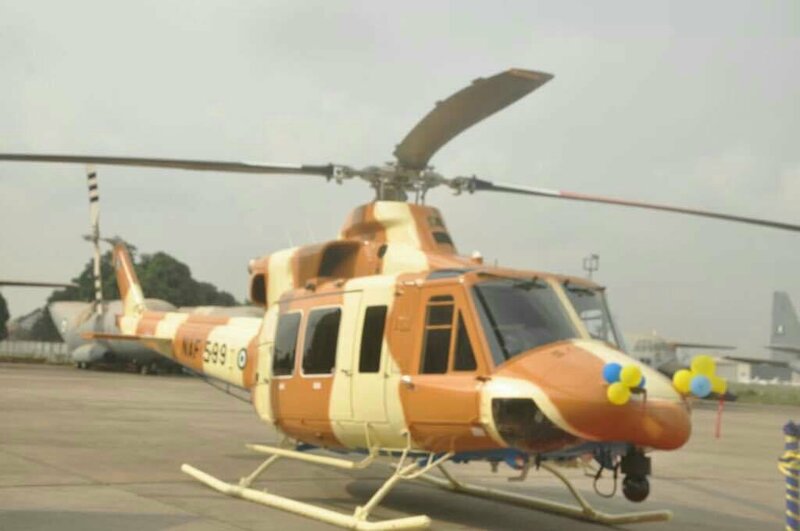 The Nigerian Air Force (NAF) yesterday, 19 January 2018, commissioned another Bell 412 Helicopter for subsequent operational deployment. The newly commissioned helicopter is one of the 2 handed over to the NAF by the Federal Government in 2017, with the first having been inducted into the NAF in November 2017. Just as the first one, the major systems of the helicopter and its surveillance cameras had to be sent to the USA and Canada for overhaul and repairs to restore their airworthiness, having been in containers for about 2 years as at the time of the handover. The helicopter’s major systems were later reassembled at the NAF’s 631 Aircraft Maintenance Depot (ACMD) Ikeja by a combined team of foreign experts as well as NAF engineers and technicians. Also yesterday, the NAF commissioned the newly reactivated Machine Tools Workshop at 631 ACMD towards enhancing aircraft maintenance capability in the Unit. According to the Chief of the Air Staff (CAS), Air Marshal Sadique Abubakar, the reactivation of the workshop, which was effectively operated last in the early 1980s, is in line with his vision of building the required capacity in the NAF. According to him, that is why the NAF had reactivated a similar workshop at 131 Engineering Group in Makurdi while another at 431 Engineering Group in Kaduna was being reactivated. He further stated that the newly reactivated workshops would boost NAF’s capacity for Research and Development as well as for technology innovation, as the moribund state of workshops in the NAF had been a limiting factor. He stated that the workshop was reactivated by NAF personnel in partnership with experts from the University of Maiduguri (UNIMAID). Air Marshal Abubakar added that the reactivation was accomplished at a minimal cost compared with millions of dollars being quoted by foreign vendors. NAF’s partnership with UNIMAID thus went a long way in saving cost for the NAF and for the nation at large. Since the reactivation of the workshop is meant to enhance personnel proficiency and productivity, the CAS announced that 20 NAF personnel had been nominated for the Intermediate Machine Tools Course to operate and maintain the equipment in the workshop. While inaugurating the Course, the CAS said, “a set of 20 students was earlier trained in the Elementary Handling and Operation of the Machines. I therefore urge you to make optimum use of this opportunity so that you can add value to the NAF”. He informed the gathering that the reactivated machines could be used for structural repairs on the C-130 Aircraft and the fabrication of some tools required for the day-to-day maintenance of the C-130 aircraft. While expressing his gratitude to President Muhammadu Buhari for his resolute support to the NAF, the CAS also appreciated the enormous support of the National Assembly, especially the Chairmen and Members of the Senate and House of Representative Committees on the NAF, for appropriating the resources required for the Service to execute its projects. Air Marshal Abubakar equally appreciated the partnership of the various Nigerian universities with whom the NAF has Memoranda of Understanding in the area of Research and Development. 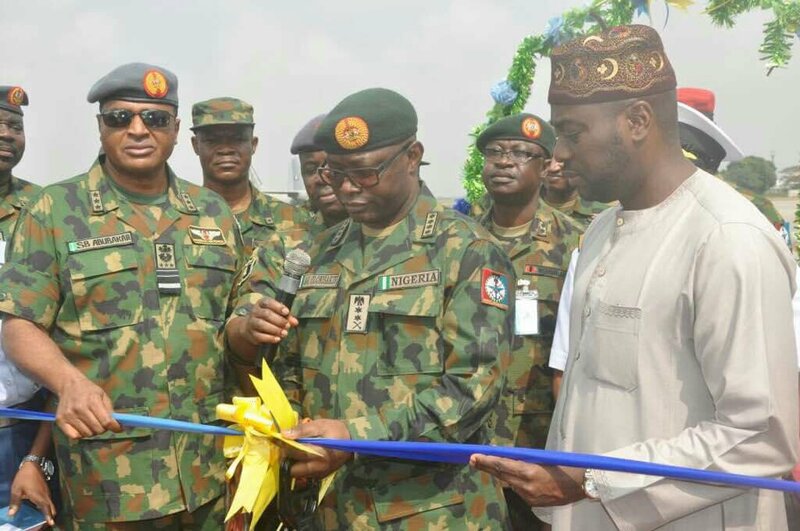 The Chief of Defense Staff (CDS), General Gabriel Olonisakin, who was the Guest of Honour (GOH) at the event, lauded the visionary and exemplary leadership of the CAS, as indicated in the manner of executing the various projects. He said the current state of affairs in the nation calls for prudent management of resources and prioritization of commitments, commending the NAF for striving towards self-sufficiency by locally maintaining its platforms. He also applauded the NAF’s partnership with UNIMAID to reactivate the workshop saying, “I am particularly impressed with the fact that of all alternatives available in revamping the workshops, you choose to partner with a Nigerian University, the University of Maiduguri”. According to General Olonisakin, “Two ingredients are critical in the development of a robust industrial base as well as an efficient Air Force. These ingredients are versatile workshops and proficient workforce. Therefore, the decision to fix this moribund machine workshops and train personnel to operate them is a step in the right direction”. The CDS also congratulated the participants of the Intermediate Machine Course, charging them to show commitment, dedication to duty and enhanced performance urging them to add value, not only NAF, but also to the nation at large. The CDS and the CAS, alongside other dignitaries, later inspected the ongoing Periodic Depot Maintenance (PDM) of a C-130H Aircraft at 631 ACMD Ikeja. The PDM is being facilitated by experts from Messrs Sabena Technics of France who are working with NAF engineers and technicians, as part of efforts at technical capacity building in the NAF. It is noteworthy that the decision to conduct the PDM locally has resulted in huge cost saving for the NAF. This is because freight costs, payment of estacode allowance, exorbitant overseas labour costs and other costs associated with ferrying the aircraft for PDM overseas, have been eliminated. The commissioning event was witnessed by the representative of His Excellency, Mr Akinwunmi Ambode, the Executive Governor of Lagos State, senior serving and retired military officers, other Lagos State Government officials, heads of paramilitary agencies and heads of government and non-governmental agencies in Lagos State as well as traditional rulers of host communities to the Logistics Command of the NAF.